Although Copenhagen has few must-see attractions, “there’s still plenty to do.” If you’re a fan of Danish design, and who isn’t, then head straight to the Designmuseum Danmark. All the classics are there: Arne Jacobsen’s Egg Chair, Poul Henningsen’s PH lamps, side tables that will be familiar to anyone who grew up in the 1960s or ’70s. 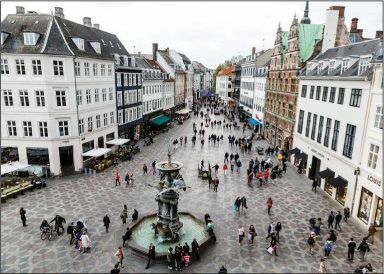 Nearby, on Stroget—one of Europe’s longest pedestrians-only shopping streets— you’ll find more quintessential Scandinavian design, including a Bang & Olufsen store filled with sleek stereos and speakers. Just blocks away stands the Rundetaarn, or Round Tower, a 17th-century observatory where visitors can climb a spiraling interior walkway to get a panoramic view of the city. Hungry from all that climbing? Fifteen Copenhagen restaurants each score one or more Michelin stars.